Even though his films are most easily classified as comedies, you rarely feel good coming out of project by writer/director Noah Baumbach. That’s not a bad thing as his caustic wit and insightful observations about terrible, self-obsessed people have lead to some great films like The Squid And The Whale. However, his latest feature is a little different. Teaming up with mumblecore darling Greta Gerwig following their collaboration on the underappreciated Greenberg, Baumbach has surprisingly delivered his most warm and sweet movie to date in Frances Ha. After being produced almost in secret, the film premiered at TIFF to a far more positive reception than he has ever received before. Hit the jump for additional appreciation for the appropriately frivolous and insightful ode to late 20s irresponsibility. Gerwig stars as Frances and as usual she’s a bumbling collection of elbows and awkward comments who gets away with it all simply for being so damn lovable. The immature goofball works as a dancer (well an apprentice to be precise), who is getting to the point that she needs to realize the limitations of her talent and can’t quite do it. On the plus side, she does have love and support flowing out of her roommate Sophie (Mickey Sumner). They’ve lived together since college and it shows. Their life is a series of lunches and they survive on a steady diet of booze and gossip. Of course, Sophie’s gig in the publishing industry pays better, so she decides to move out, leaving Frances alone for the first time. She doesn’t even bother to visit or chat anymore since she’s getting serious with her boyfriend. Oh and Frances essentially gets fired from her job. Sounds like its time for a good old fashion comedy meltdown, right? 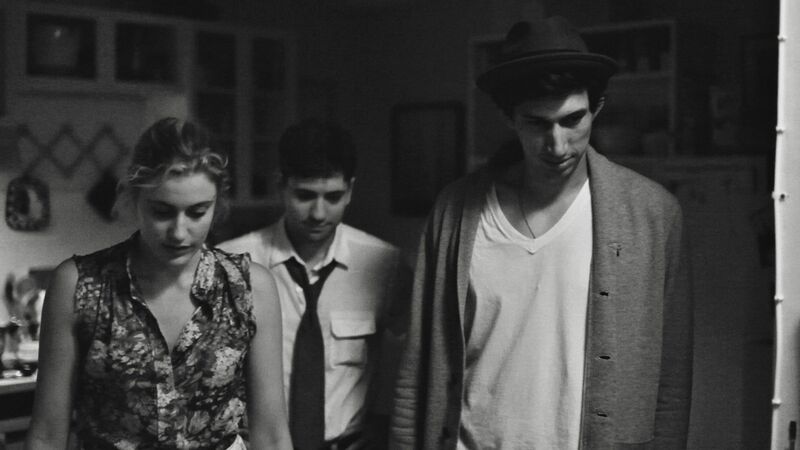 Most of Frances Ha is spent wandering along with Gerwig from one social disaster to the next. Throughout it all, she survives on a healthy mix of optimism and self-delusion. She moves into a group apartment with two pampered rich kids that she can’t afford, takes irrational impromptu vacations, and finds a way to embarrass herself every time she opens her mouth. “I’m not a real person yet,” she claims at one point and indeed the character is a poster child for that special age when people are too immature to be adults and too old to drift much longer. You could call it a coming of age story, but that seems to be a bit dismissive of what Baumbach and his star/co-writer Gerwig actually accomplished. Baumbach is a director with a complete inability to slide into sentimentality or schmaltz. He’s more than happy to observe and dwell on the deep flaws of his characters, yet unlike past efforts there’s some sympathy amongst the harsh honesty. That tone all comes down to Gerwig. Her character is as lost and confused as any in his back catalogue, Gerwig just provides a little light. Even though there are plenty laughs to be had at the expense of the confusion and underachievement of Frances and everyone around her, the script presents those issues as universal and more importantly, surmountable. Shot in black and white around the street of Brooklyn, comparisons to Woody Allen’s Manhattan are inevitable. That’s not quite accurate, but then everyone tends to remember that bitter little pill as an uplifting romantic comedy for some reason. The motivation behind the black and white visuals is unclear and if anything is more of an homage to the French New Wave than anything else (there are several vintage score drops from Goddard and Truffaut’s go-to composer Georges Delerue). Despite that monochrome look, there’s a freewheeling nature to the photography that lends itself to the naturalistic performances. Gerwig is predictably excellent, effortlessly funny while still retaining a dramatic weight. Mickey Sumner provides a perfect balance as Sophie, her cold cynicism a strong counterpoint to Gerwig’s wacky lifestyle of smiles and diversions. The other actors are good as well, but tend to flow in and out of the episodic narrative freely. It’s ultimately the Gerwig/Baumbach show and appreciation does depends on enjoying at least one of the two. Frances Ha is certainly a sweet and funny movie, but don’t allow the praise to build up the movie into more than it is. This is a tale about privileged white kid problems that will irritate plenty of folks. However, at a trim 86 minutes it flies by just as quickly as a film about such frivolous subject should. The fact that any questioning or harsh reality appears at all is a bonus for this kind of film and if you’re willing to give yourself over to the hipster-baiting/mocking charms, it could be one of the most purely pleasurable films you’ll see all year. Click here for all of our TIFF 2012 coverage.